The Fayetteville shale gas play is located within the Arkoma Basin in Arkansas. Fayetteville is divided into two main units, Central and Western based on the location of the shale. Fayetteville Central extends from the Arkansas-Oklahoma border to the East of Johnson, Logan and Yell counties. Based on the U.S. Department of Energy, the total area for the Fayetteville shale play, including Central and Western Fayetteville, is 9,000 square miles. Fayetteville Central is 4,000 square miles and the remaining shale, Fayetteville Western, is approximately 5,000 square miles. The shale gas play has an average EUR of 1.7 BCF per well and approximately 31.96 TCF of technically recoverable gas. The shale ranges from 1,000 to 7,000 feet deep and 20 to 200 feet thick. Average properties of the Fayetteville shale are: depth (4,000 ft.), thickness (110 ft.), porosity (5%), and total organic content (6.9%). As of 2008, there are 9 companies active on the shale, and these companies have leased a total of 1,970,426 net acres (3,079 square miles). In 2010, XTO Energy reported that they increased their Fayetteville acreage to 380,000 net acres. Carrizo Oil and Gas reported 26,000 net acres and Southwestern Energy has a total of 888,695 net acres in 2010. According to Southwestern Energy, the average well cost completed for 2009 was $2.9 million dollars. This is within the range of $1.75 to $3.05 million dollars as reported by Deutsche Bank. Southwestern Energy drilled and completed 249 wells within the first six months of 2010. They plan on participating in 650 to 680 wells by the end of the year and operate on 475 to 500 wells. Currently, Chesapeake Energy is operating about 8 rigs and plans to have about 10 rigs in 2010 to drill about 85 net well. 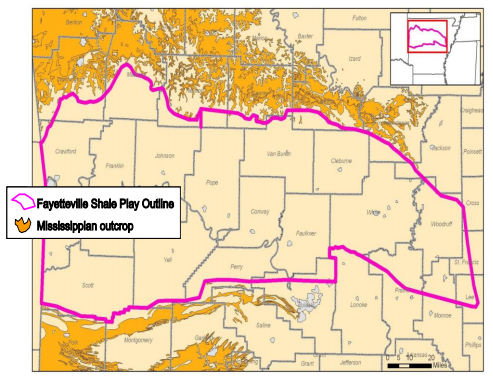 In 2010, the USGS conducted an assessment for the Fayetteville Shale Gas-Western Arkansas Basin Margin. They estimated that the total undiscovered resource is between 2,260 and 6,865 BCF, with a mean of 4,170 BCF.